Breakfast is the most important meal of the day. It provides the nutrients and energy required to start a day. Since a breakfast is the most important meal of the day, one must never skip it. Sometimes, people tend to skip breakfast in order to lose some weight. A hot cereal in the morning, mixed with low fat variants, such as low fat muesli, and low-fat milk are good options for getting into the habit of having a breakfast. Another idea would be to add some fruit or reduced calorie syrup to provide a dull breakfast some zing. Some people consider eggs as a diet disaster. On the contrary, eggs are a rich source of protein, vitamin B and vitamin K, folic acid – especially important for a woman’s health, and may be eaten with bacon, sausages or even a slice of whole wheat bread. Make those high calorie foods jewels in the crown. For example, you may make that spoonful of ice cream as the jewel sitting atop a bowl of fruit. Once you are through with your breakfast, make water your primary drink. While an orange juice would be a good option after the meal, consumption of soda, juice or any other sugary drink adds to the body’s existing weight. Moreover, these drinks do not give the body a sense of fullness and barely suffice the hunger pangs. Downsizing your meal plates would help further. Due to its low capacity, a comparatively small plate would contain less food. Moreover, since you would be more calorie conscious, you would opt for more healthy food items in that small plate, leaving less space for the non-healthy, fattening options. Binge eating in cases when one goes over emotional, such as in cases of sadness, remorse, happiness, is not good for the health. Avoid this habit as it would lead you to regret later. A positive state of mind towards your goal of losing weight, walking or jogging in the morning, eating a health oriented breakfast would definitely help you achieve it. 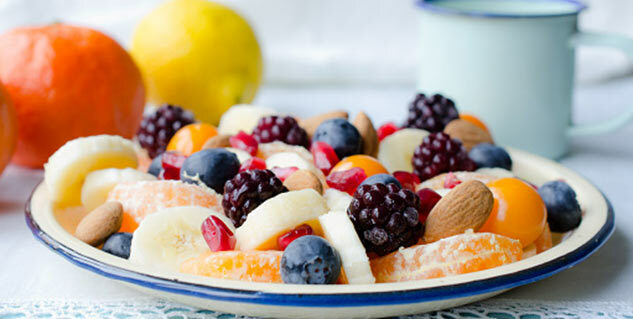 Eat a fruit instead of drinking fruit juice. Whole foods keep you satisfied much longer than a box of apple juice, so you will eat less overall. Opt for eating water-rich food such as tomatoes, zucchini, even cucumbers during meals to reduce overall calorie consumption. If you want to have coffee or tea with your breakfast, take a cup of regular coffee with skimmed milk, which has only a small fraction of calories. which double due to whole milk, whipped cream, sugar, and sugary syrups when had had those fancy coffee joints. Eat cereal for breakfast five days a week to reduce the likeliness to be obese and have diabetes. Therefore, the key is to consume small portions of food and make sure you chew them well. Try taking out some time for breakfast and include only healthy food items in it. Eating fast food must be avoided because not only are they least nutrient, but also responsible for building unhealthy fat in the body. One may therefore look at these weight loss ideas for breakfast.